The war crimes trial of Slobodan Milošević , the former President of Yugoslavia, at the International Criminal Tribunal for the former Yugoslavia (ICTY) lasted from February 2002 until his death in March 2006. Milošević faced 66 counts of crimes against humanity, genocide and war crimes committed during the Yugoslav Wars of the 1990s. He pleaded not guilty to all the charges. On 11 March 2006, former Yugoslav president Slobodan Milošević died in his prison cell of a heart attack, while being tried for war crimes at the ICTY in The Hague, which was a major news story internationally. Milošević died a few months before the verdict was due for his four-year trial. It occurred shortly after the Tribunal rejected his request to seek specialized medical treatment at a cardiology clinic in Moscow, but the report of 30 May 2006 confirmed that he had died of natural causes and that there was "no poison or other chemical substance found in his body that contributed to the death". 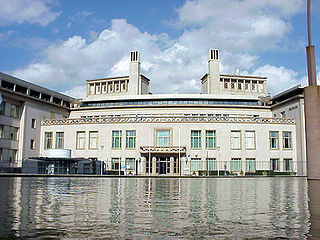 The Prosecutor v. Radovan Karadžić was a case before the International Criminal Tribunal for the former Yugoslavia in The Hague, Netherlands, concerning crimes allegedly committed during the Bosnian War by Radovan Karadžić, the former President of Republika Srpska. On 24 March 2016 he was found guilty of 10 of 11 counts of crime including war crimes, genocide and crimes against humanity, and sentenced to 40 years imprisonment. Milošević was indicted in May 1999, during the Kosovo War, by the UN's International Criminal Tribunal for the Former Yugoslavia for crimes against humanity in Kosovo. Charges of violating the laws or customs of war, grave breaches of the Geneva Conventions in Croatia and Bosnia and genocide in Bosnia were added a year and a half later. Following Milošević's transfer, the original charges of war crimes in Kosovo were upgraded by adding charges of genocide in Bosnia and war crimes in Croatia. On 30 January 2002, Milošević accused the war crimes tribunal of an "evil and hostile attack" against him. The trial began at The Hague on 12 February 2002, with Milošević defending himself. Rade Marković stated that a written statement he had made implicating Milošević had been extracted from him by ill-treatment legally amounting to torture by named NATO officers  Judge May declared this to be "irrelevant", but Milošević stated that it was forbidden under the 1988 rules concerning evidence gained by torture. Torture is the act of deliberately inflicting severe physical or psychological suffering on someone by another as a punishment or in order to fulfill some desire of the torturer or force some action from the victim. Torture, by definition, is a knowing and intentional act; deeds which unknowingly or negligently inflict suffering or pain, without a specific intent to do so, are not typically considered torture. Torture has been carried out or sanctioned by individuals, groups, and states throughout history from ancient times to modern day, and forms of torture can vary greatly in duration from only a few minutes to several days or longer. 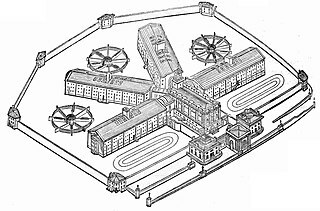 Reasons for torture can include punishment, revenge, political re-education, deterrence, coercion of the victim or a third party, interrogation to extract information or a confession irrespective of whether it is false, or simply the sadistic gratification of those carrying out or observing the torture. Alternatively, some forms of torture are designed to inflict psychological pain or leave as little physical injury or evidence as possible while achieving the same psychological devastation. The torturer may or may not kill or injure the victim, but torture may result in a deliberate death and serves as a form of capital punishment. Depending on the aim, even a form of torture that is intentionally fatal may be prolonged to allow the victim to suffer as long as possible. In other cases, the torturer may be indifferent to the condition of the victim. The prosecution took two years to present its case in the first part of the trial, where they covered the wars in Croatia, Bosnia, and Kosovo. Throughout the two-year period, the trial was being closely followed by the public of the involved former Yugoslav republics as it covered various notable events from the war and included several high-profile witnesses. During the prosecution case, 295 witnesses testified and 5,000 exhibits were presented to the court recording a mass of evidence[ citation needed ]. After the presentation of the prosecution case, the Trial Chamber, on 16 June 2004, rejected a defense motion to dismiss the charges for lack of evidence and ruled in accordance with Rule 98bis, that the prosecution case contains evidence capable of supporting a conviction on all 66 counts. The Defense was given the same amount of time as the prosecution to present its case. There were in total 466 hearing days, four hours per day. 40 hours were left in the Defense case, and the trial was on schedule to end by the end of the spring. Autopsies soon established that Milošević had died of a heart attack. He had been suffering from heart problems and high blood pressure. Many suspicions were voiced to the effect that the heart attack had been caused or made possible deliberately – by the ICTY, according to sympathizers, or by himself, according to critics. In the indictment which was judicially confirmed in 2001, Milošević was accused of 66 counts of genocide, crimes against humanity and war crimes committed in Croatia, Bosnia and Herzegovina and Kosovo between 1991 and 1999. These crimes affected hundreds of thousands of victims throughout the former Yugoslavia. Due to Milošević's death during the trial, the court returned no verdict on the charges. "The Prosecutor of the Tribunal against Slobodan Milošević (IT-02-54) - Indictment" (PDF). 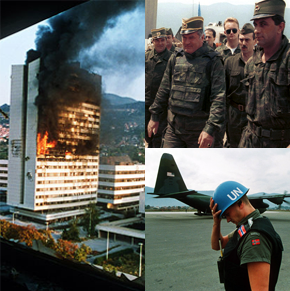 International Criminal Tribunal for the former Yugoslavia. October 22, 2002. Armatta, Judith (2010). Twilight of Impunity: The War Crimes Trial of Slobodan Milosevic. Durham: Duke University Press. ISBN 9780822391791. The Socialist Party of Serbia is a political party in Serbia that identifies as a democratic socialist and social democratic party. The Socialist Party of Serbia was the direct descendant of the Communist Party of Serbia. Throughout its existence, the party has utilised some nationalist rhetoric and themes, and has therefore been labelled a Serbian nationalist party, although the SPS has never identified itself as such. Momčilo Krajišnik is a former Bosnian Serb political leader, who along with Radovan Karadžić co-founded the Bosnian Serb nationalist Serb Democratic Party (SDS). Between 1990-92, he was Speaker of the People's Assembly of Republika Srpska. Between June and December 1992, he also served as member of the expanded Presidency of Republika Srpska. Republika Srpska was a proto-state in Southeastern Europe under the control of the Army of Republika Srpska during the Bosnian War. 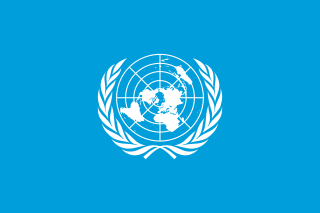 It claimed to be a sovereign state, though this claim was not recognized by the Bosnian government, the United Nations, or any other recognized state. For the first few months of its existence, it was known as the Serbian Republic of Bosnia and Herzegovina. Milan Lukić is a former head of the Serb paramilitary group known as White Eagles who was found guilty by the International Criminal Tribunal for the Former Yugoslavia (ICTY) in July 2009 of crimes against humanity and violations of war customs committed in the Višegrad municipality of Bosnia and Herzegovina during the Bosnian war and sentenced to life in prison. 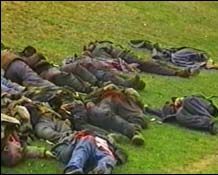 The Izbica massacre was one of the largest massacres of the Kosovo War. Following the war, the International Criminal Tribunal for the former Yugoslavia (ICTY) found that the massacre resulted in the deaths of about 93 Kosovo Albanians, mostly male non-combatants between the ages of 60 and 70. Nikola Šainović is a Serbian politician. Being a close associate of Slobodan Milošević, he held several important state functions of Serbia and FR Yugoslavia during the 1990s. He has been a member of the Socialist Party of Serbia since the party's foundation. Joint criminal enterprise (JCE) is a legal doctrine used during war crimes tribunals to allow the prosecution of members of a group for the actions of the group. This doctrine considers each member of an organized group individually responsible for crimes committed by group within the common plan or purpose. It arose through the application of the idea of common purpose and has been applied by the International Criminal Tribunal for the former Yugoslavia to prosecute political and military leaders for mass war crimes, including genocide, committed during the Yugoslav Wars 1991–1999. Radovan Karadžić is a Bosnian Serb former politician and convicted war criminal who served as the President of Republika Srpska during the Bosnian War and sought the unification of that entity with Serbia. A series of war crimes were committed during the Kosovo War. Yugoslav security forces killed many Albanian civilians during the war. According to Human Rights Watch, the vast majority of the violations from January 1998 to April 1999 were attributable to Serbian Police or the Yugoslav Army. Violations also include abuses committed by Kosovo Liberation Army, such as kidnappings and summary executions of other minority races and Albanians. O-Gon Kwon is a noted international South Korean judge, best known for being one of the three judges in the trial of Slobodan Milošević. He also sat on the bench for the trial of former Bosnian Serb leader, Radovan Karadžić. Thomas Kamilindi, author of Journalism in a Time of Hate Media, describes hate media as a form of violence, which helps to demonize and stigmatize people that belong to different groups. This type of media has had an influential role in the incitement of genocide, with its most infamous cases perhaps being Radio Televizija Srbije during wars in Yugoslavia, Radio Télévision Libre des Milles Collines (RTLM) during the Rwandan Genocide and Nazi Germany’s Der Stürmer. Vladimir Lazarević is a Serbian colonel general of the Third Army Corps, and later the commander of the Priština Corps of the Federal Republic of Yugoslavia. He was indicted by the International Criminal Tribunal for the former Yugoslavia 2003 and was convicted in 2009 of command responsibility for war crimes against Kosovo Albanians during the Kosovo War. The architectural heritage of the Kosovo Albanians during Yugoslav rule was shown institutionalised disregard for decades prior to outright conflict at the end of the 20th century. Numerous Albanian cultural sites in Kosovo were destroyed during the period of Yugoslav rule and especially the Kosovo conflict (1998-1999) which constituted a war crime violating the Hague and Geneva Conventions. In all, 225 out of 600 mosques in Kosovo were damaged, vandalised, or destroyed alongside other Islamic architecture during the conflict. Additionally 500 Albanian owned kulla dwellings and three out of four well-preserved Ottoman period urban centres located in Kosovo cities were badly damaged resulting in great loss of traditional architecture. Kosovo's public libraries, of which 65 out of 183 were completely destroyed, amounted to a loss of 900,588 volumes, while Islamic libraries sustained damage or destruction resulting in the loss of rare books, manuscripts and other collections of literature. Archives belonging to the Islamic Community of Kosovo, records spanning 500 years, were also destroyed. During the war, Islamic architectural heritage posed for Yugoslav Serb paramilitary and military forces as Albanian patrimony with destruction of non-Serbian architectural heritage being a methodical and planned component of ethnic cleansing in Kosovo. ↑ "Public Redacted Version of Judgement Issued on 24 March 2016 in Prosecutor vs. Radovan Karadžić, p. 1303" (PDF). ICTY. Retrieved 20 July 2016. ↑ "TPIY : The Cases". ICTY. Retrieved 9 October 2011. ↑ "020726IT". Milosevic-trial.org. Retrieved 9 October 2011. 1 2 Armatta 2010 , p. 92. "One of the methods used to persecute the Kosovar population was to wreak systematic and wanton destruction and damage to their religious sites and cultural monuments, according to the indictment. Such destruction committed on political, racial, or religious grounds is a crime against humanity. Through the testimony of Andras Riedlmayer, an international expert on the Balkan cultural heritage of the Ottoman era, the prosecution sought to prove Milosevic guilty of it." 1 2 3 4 5 6 7 Armatta 2010 , pp. 93-94 "Riedlmayer, associated with Harvard University, provided a report of his investigations of war damage to cultural and religious sites in Kosova. Based on a two-year study that he undertook with the architect and Balkan specialist Andrew Herscher between July 1999 and the summer of 2001, sponsored by Harvard’s Center for Middle Eastern Studies, the report concluded that three out of four urban centers dating to the Ottoman years were devastated as a result of intentionally set fires. Serbian police, army troops, paramilitaries, and in some cases Serb civilians perpetrated these attacks, according to eyewitnesses. In addition, traditional Albanian residential buildings, called kullas, were targeted for destruction. Over one-third of all mosques in Kosova were damaged or destroyed. 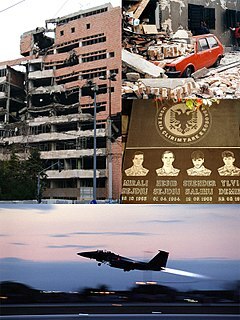 While Milosevic asserted that NATO bombardment was responsible for damage to Kosova Albanian heritage sites as well as for damage and destruction to Serbian Orthodox religious and historical monuments, Riedlmayer’s study absolved NATO of responsibility for all but damage to the roof of one village mosque and to a disused Catholic church, damaged by an air blast during a missile strike on a nearby army base. In several cases where Serb authorities alleged complete destruction of monuments by NATO (such as the Sinan Pasha Mosque and two Ottoman bridges), investigators found the monuments completely intact. Riedlmayer described how investigators reached their conclusions that damage was not caused by air strikes.... Throughout the province, Riedlmayer and his co-investigators found damage and destruction of Kosova Albanian cultural heritage sites from ground attack during the war and what appeared to be Kosovar attacks against Serbian cultural heritage sites after the war. He also learned that Serbian forces used two Catholic churches as bases of operation, which was prohibited by international law. Riedlmayer later testified to similar destruction of Islamic religious and cultural sites during the Bosnian war." ↑ "Europe | Milosevic found dead in his cell". BBC News. 11 March 2006. Retrieved 21 January 2012. ↑ Decision on Assigned Counsel Request for Provisional Release. ICTY, 23 February 2006.